Del.icio.us has around for a long while now. Unfortunately, it took me a long time to jump onboard. Mainly because the description of Del.icio.us was not very interesting to me. "Social bookmarking?" What the heck is that and why would I want to do it? I already have a blog, my blog has links, I read digg, and I don't want to be social damn-it! Well, then I actually signed up for Del.icio.us and it changed my [online] life,.. literally. In an effort to get more people to understand Del.icio.us as more than a site with a funny URL here is my brief introduction to Del.icio.us [ok, this turned out to not be so brief]. See that drop down menu at the top of your browser called Bookmarks (or Favorites in IE). You already know how to use that. You add links to your bookmarks and they appear in that menu. If you need to find the page you bookmarked the other day just look in your Bookmarks menu and there it is. Oh wait, it's not? Where did it go? Oh, yes; you bookmarked that at work or on your spouses computer... or was it at your in-laws' house on thanksgiving. Now image that if every computer you were at had your bookmarks. Well you can do it with Del.icio.us. 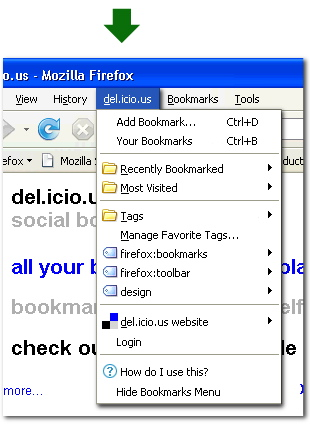 And with a Del.icio.us plugin for Firefox or Internet Explorer you can add and view bookmarks to your Del.icio.us account from the browser just as easily as the bookmark menu and they are automatically synchronized with your Del.icio.us account online. If you are on someone else's computer or a public computer your bookmarks are available on the del.icio.us website. Bookmark a site at work, find it when you get home. Bookmark a website at home, find it when you are at your in-laws' house. Very convenient. Best of all the "advanced" Del.icio.us Firefox extension integrates so nicely with the Firefox browser that there is no need to use the bookmarks feature at all. Now with the bookmark feature built-into your browser the bookmarks you create are organized into folders. This works but what do you do when you come across, say, a political cartoon? Do you bookmark it under humor or politics. Which ever one you choose you will forget later. Well with Del.icio.us you don't use folder you use tags. Tags are like folders on steroids. For the political cartoon you can tag the page with both politics and humor. So when you search within your bookmarks for humor or politics you will find the link each time. Even better when you search for "politics+humor" you every thing you've tagged as politics and humor. Del.icio.us can also function as a productivity tool. Imagine you are surfing the net at work (during your break of course) and you see a piece of software that you want to download and try later at home. Simply bookmark the site with the tag "todo:download". Or if you see a long post that you don't have enough time to read on your break. Bookmark it with the tag "todo:read". When you get home check your todo tags for things to do. And there is the "Social" part of the "Social Bookmarking". By default all the links you add are available for others to see. For example you can see the pages I've bookmarked at http://del.icio.us/Hypercubed or all my "development links" at http://del.icio.us/Hypercubed/development. You can also set bookmarks as "not shared" to protect your privacy. My only complaint is that there is not a way to set an entire tag as private so you need to remember to set your "todo:buy_for_wife" links to private every time you create one. Now I know what you are saying... "sounds nice but I already have all these bookmarks. I don't want to start over." Well good news. 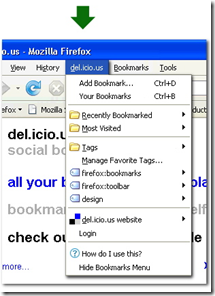 When you create your Del.icio.us account you have the option of importing your Firefox and/or Internet Explorer bookmarks. There is actually a lot more to Del.icio.us including RSS feeds of bookmarks, a social network, and subscriptions but I hope I piqued your interest enough to get you started on your own. Try it, I don't think you will regret it.